Kathmandu Sightseeing- The world Heritage sites “Pashupatinath, Patan Durbar square” etc. The traditional lifestyle of Tamangs and Gurung people and thye Teahouses. The Beautiful Vistas of Annapurna Himalayan range. The suspension bridges and beautiful Rhododendron Forests. Muktinath “God Of Salvation”. The temple located on the highest altitude of the world. The Annapurna Circuit trek is one of the best Trek in the world. It offers the diverse culture, lifestyles and topography on the shadow of incredible mountain vistas. This is also known for the most diverse and stunning tea house trek in the Himalaya. The breath stopping view of some of the most stunning 8000 meter peaks including the Annapurna and Dhaulagiri ranges – simply wonderful. We explore the nature diversity through lush, tropical rice paddies and moss- laden rhododendron forests to Tibetan fortresses clinging to rocky cliffs. Walking through the naturally rich terrain having diverse topography one has a chance to experience the rich cultural diversity of Hinduism, Buddhism. Annapurna region is best described as the most happening incentive trekking destination. The Annapurna Circuit Trek have been proved as a highly praised and spectacular trekking trail in the Annapurna region since it opened for foreign trekkers in 1977. This trek starts from Besisahar and goes along the Marsyangdi river, with great view of Manashlu and Himalchuli to the East. This magnificient trek leads you to the village inhabited by a wide diversity of peoples belonging to different ethnic groups, offering spectacular and majestic view of the white Himalayas. As it continues to the north of the main Himalayan range on to the high and dry Tibetan Plateau, the scenery is equally breath stopping. The incredible views of high mountains, peaceful environments, rhododendron forests and other sub-tropical forests gives pleasure to the trekkers. 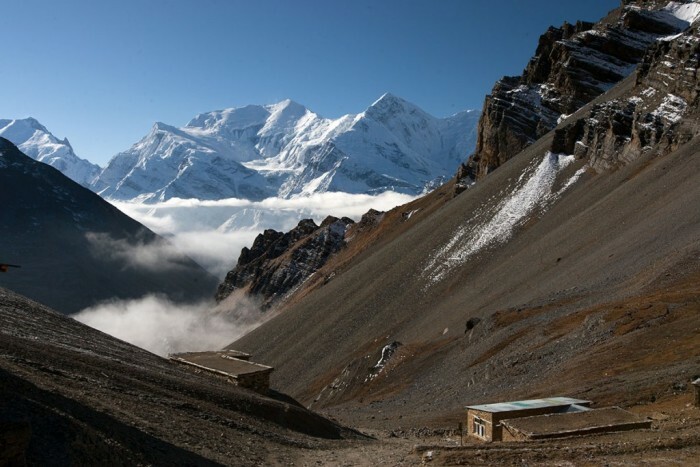 Annapurna Circuit Trek has been taken as the best trekking trail in the world. The highest point of the trek is Thorungla pass at the top valley at 5416 meters (17,679 ft) height. Offering one of the most diverse and stimulating trekking routes anywhere in the world the Annapurna Circuit is great both for those who are seeking a challenge and those looking for a trek that can be tailored to suit a shorter more leisurely pace. For many The Annapurna Circuit Trek has proved to be a highlight in their life providing the fuel for the new challenges and others simply visits again and again. Whatever it will mean to you, we’ll be happy to accompany you on this journey. Feel free to contact us for more information and individual advice. Entry fees in Kathmandu sightseeing. Annapurna National Park permits and TIMS (Trekkers Information Management System) permit. Welcome to Kathmandu. We’ll be there for your warm welcome and to help you to transfer to the hotel. There will be a short briefing in the hotel about the trek. You will be introduced to guide. You can just lighten up at hotel. We will introduce you to the Nepali dinner. Overnight stay at Kathmandu. After having breakfast, we will visit the Pashupatinath Temple (world heritage site), situated at the bank of holy river Bagmati. Only Hindus are permitted to enter the Pashupatinath Temple. After that we will head to Bouddanath Mahachaitya, and after having lunch we will go for Patan Durbar Square ( world heritage site) and return back to hotel and prepare for trek. Dinner at hotel. Overnight stay in Kathmandu. Today our actual trekking begins. We will drive to Bulbule from Kathmandu in a private vehicle. Enjoying the beautiful scenes and landscapes, we will be there by around 7 hours. We will also walk on a suspension bridge and carry on walking through magnificent terrace farm to get to Nagdi community, before reaching Bulbule. At Bulbule, we can discover the views of Lamjung Himal, Manaslu, Peak 29 (Nadi Chuli) etc. Dinner and overnight at Tea house. After having breakfast, we will hike to Jagat Village taking 5 hours. On the way, we will get the chance to observe the V- shape image of Marshyangdi valley. Then we will walk along the crisscross path along the Syange and Descend down to the river bank. Also we will go down to Jagat Village. This is the tiny village where Tamang and Gurungs inhibits. Dinner at Jagat Village. Overnight stay at tea house. Leaving Jagat Village behind, we will walk to Danakyu lying at the altitude of 2300 meters. We will reach Danakyu after walking for about 5 hours. At Danakyu, we will see the eye-catching views of Mt. Manashlu and Peak 29. Dinner in Danakyu. Overnight stay in Teahouse. Today we will walk for around 5 hours after having breakfast to reach Chame. On the way we will see Dudh Khola flowing from the south face of Manashlu. We will also notice the Marshyangdi swerving to the left side where dramatic peak site of the Annapurna II also enthralls you. Then after passing fir – woods, we will enter to District headquarter of Manang-Chame lying on the shore of the river. Dinner in Chame. Overnight stay at Teahouse. Today Pisang is waiting us at the height of 3300 meters. Experiencing the fascinating view of first rays of sun over the white mountains, and marvelous waterfall we reach to Brathang village. We will see long Mani Wall before reaching Pisang. Pisang is found in the heart of the Pisang Peak. Dinner in Pisang. Overnight at Teahouse. Today our journey starts from Pisang to Ghyaru Village. On the way we will see the fantastic views of Annapurna II and Annapurna III. Then we’ll stroll to Manang Village taking about 6 hours. Today we will also notice the beautiful tracks full of grasslands.The trail bestows the amazing vistas of The Annapurna Himalayan Range. We will ascend to the Nawal to experience the best scene of Annapurna. Dinner in Ghyaru. Overnight at Teahouse. We will rest in Manang village today to get properly accustomed with the high altitude and avoid altitude sickness. Optinally, we can explore Manang. Witnessing Gangapurna Lake and Mountaineering school are the major attraction of this place. Dinner and Overnight stay at Teahouse. After having breakfast, we will walk for around 4 hours to reach Ledar located at the altitude of 4200 meter. The breathtaking views of Annapurna will move along with you. Furthermore, we can observe the beautiful views of Himchuli, Peak 29 at our back. We will then pass Gunsang settlement where we will cross Gundon river via a wooden bride to reach Ledar. Overnight at Teahouse. Today we will walk steadily upwards to an edge and move down to the Marshyangdi river. Then we will transverse through a wooden bridge. In addition we have slender track that moves transversely to an uneven hill and after that ascends to Thorungla Phedi. It takes approximately 3 hours.Dinner in Phedi. Overnight at Tea House. Day 12: Hiking up to Thorung-La pass (5416m) and trek down to Muktinath. We will walk downward to the Marshyangdi River and pass through the wooden bridge. Also we will walk through the right coast of the river. Then we will go through the track that turns slender and moves crossways from side to side with a shaky incline and walk down to thorung-la pass lying at 5416m. Also we will shift down to Muktinbath ‘God of Salvation’ taking roughly 5 hrs. Muktinath is the holy place for both Hindus and Buddhists. Here, you will observe water flowing from 108 stone taps and a temple devoted to Lord Vishnu. Dinner and Overnight at Tea House. After breakfast, we will move passing by settlements like Khingar as well as Jharkot filled with typical Tibetan architecture. We will be pleased with magnificent views of Nilgiri and Dhaulagiri en-route. As a final point, we will walk to Jomsom, a big set expanded next to both shores of the Kaligandaki River. Dinner and Overnight at tea house. Today, in the very early morning we will drive to Pokhara by Bus. It will take approximately 6 hours to reach Pokhara. You will be there in 3 to 4 pm. Dinner at Pokhara. Overnight stay in Hotel. After having breakfast, we will drive to Kathmandu. We will have lunch on the way. After reaching Kathmandu , you can just relax in the hotel or go for shopping. Dinner in Hotel. Overnight stay at Kathmandu. Today is your last Day in Nepal. You are leaving Nepal with breathtaking memories and splendid time spent in the Annapurna Himalayan Region. We will transfer you to the Tribhuwan International Airport for your departure.